There were plenty of awards going around at Sunday's 2016 Academy Awards, but no non-actor category was quite as much of a sausage fest as the 2016 Best Director Oscar category. Among the contenders were last year's winner, Alejandro González Iñárritu (The Revenant), Tom McCarthy (Spotlight), Adam McKay (The Big Short), George Miller (Mad Max: Fury Road), Ridley Scott (The Martian), and Lenny Abrahamson (Room). And look, I'm not saying that these men aren't talented directors — I would personally split the trophy in two and hand deliver each half to McCarthy and Miller for their incredible 2015 films if the Academy would let me — but man, is this category a boys' club. (Work fast, Feds investigating Hollywood's lack of female directors. Please and thank you.) But even with this homogenous group, this year's Best Director race is notable for its potential mark on history: Now that Iñárritu has won the award for 2016 Best Director he is the third person in Oscars history to win back to back Best Director awards. Before Iñárritu, both Joseph L. Mankiewicz (A Letter to Three Wives and All About Eve) and John Ford (The Grapes of Wrath and How Green Was My Valley) were the only two to hold the record. And while The Revenant taking top honors in all of its Golden Globe categories and being nominated for multiple Oscars including top categories caused a bit of a schism among cinephiles — many of whom wouldn't have chosen The Revenant and its 82 percent fresh Rotten Tomatoes score for the year's top honors — you have to admit that two trophies in a row is an impressive feat. And come on, whether or not you wanted to spend three-hours with a beleaguered and barely-breathing Leo DiCaprio in the wintry middle American wilderness, you have to admit the film was at least beautifully made. 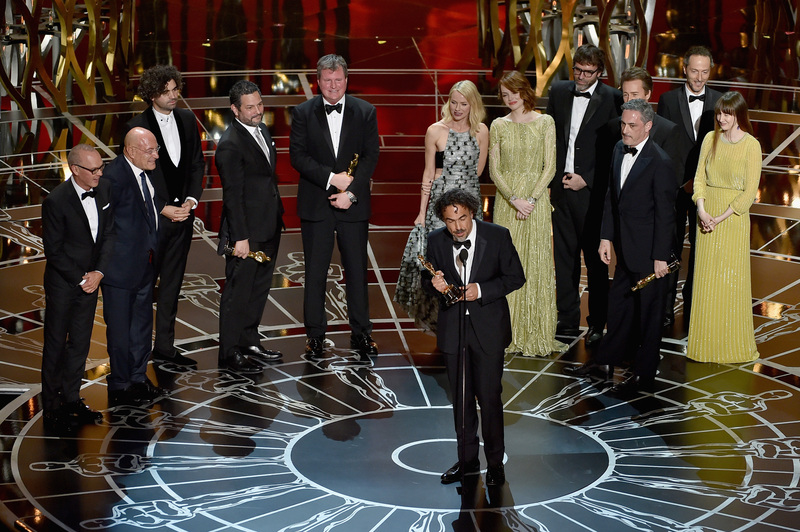 In his speech, Iñárritu thanked, of course, the cast of his film, including DiCaprio. As he put it, "Leo, you are The Revenant." He went on to touch on racial prejudice, noting a line from the film in which DiCaprio's half-white half-Native American son is told that people only see the color of his skin. Iñárritu said he hopes that one day "the color of the skin becomes as irrelevant as the length of our hair." Well said!